Earlier today the Digital Media Law Project released a new report, The Legal Needs of Emerging Online Media: The Online Media Legal Network after 500 Referrals. The Digital Media Law Project is pleased to announce the release of its report, The Legal Needs of Emerging Online Media: The Online Media Legal Network after 500 Referrals. UPDATE: The chat session scheduled for April 10, 2014 has been postponed. We hope to have a rescheduled date soon, so please stay tuned. An amended bill passed Sept. 12 by the Senate Judiciary Committee to protect journalists from being forced to reveal confidential sources in federal court includes a relatively broad definition of who would be covered by the law; a definition that would include most bloggers. As a Los Angeles Superior Court prepares to break new ground concerning defamation on Instagram, journalists look towards the popular smart phone app as an alternative platform from which they can reach new audiences. Whether we consider the purpose of copyright to be to protect economic rights or moral rights, copyright is a powerful yet dangerous instrument. James Rosen is a national news journalist for the Fox News Channel. On June 11, 2009, Rosen published an article on www.foxnews.com entitled "North Korea Intends to Match U.N. Resolution with New Nuclear Test." His Gmail email account is referenced in the case's court documents as "Redacted@gmail.com." On May 28, 2010, Reginald B. Reyes, a Special Agent for the FBI filed an application for a search warrant for James Rosen's Gmail account, which was maintained by servers located at Google's headquarters in California. The search warrant application stated that the emails concealed information which, under Fed. R. Crim. P. 41(c), contained: (1) evidence of a crime; (2) contraband, fruits of crime, or other items illegally possessed; and (3) property designed for use, intended for use, or used in committing a crime. The warrant application stated that the search was related to a violation of 18 U.S.C. § 793, which governs the "gathering, transmitting or losing defense information." The search warrant application included an affidavit by Agent Reyes in support of the search warrant. Reyes' affidavit said the warrant was pursuant to 18 U.S.C. § 2703 and 42 U.S.C. § 2000aa and permissible as the U.S. District Court for the District of Columbia has jurisdiction over the offense under investigation. Reyes states that he believes there is probable cause that Rosen violated Section 793(d) as an aider and abettor and/or co-conspirator to Stephen Kim. That same day, a search and seizure warrant was issued by a U.S. Magistrate Judge to be executed on or before June 11, 2010. The warrant granted the search of electronic e-mails and other electronic data of Rosen's account, and permitted the officer executing the warrant to delay notice to Rosen for 30 days under 18 U.S.C. § 2705. An attachment to the issued warrant stated that Google, Inc. was not permitted to notify "any other person, including the subscriber(s) of Redacted@gmail.com" of the warrant's existence. 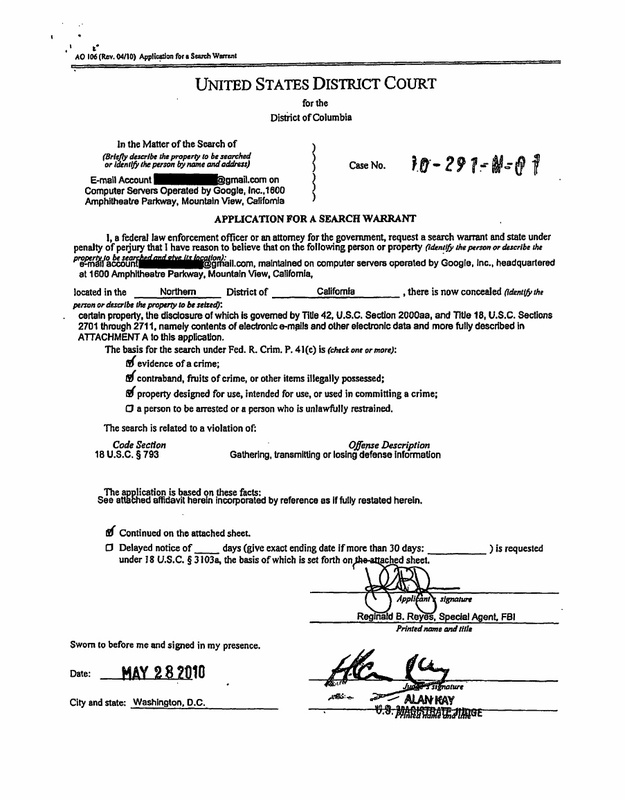 Google, Inc. was required to make exact duplicates of all information from the email account and send this information to Agent Reyes in overnight mail or facsimile. The attachment asked for any commuications between Rosen's account and 3 other accounts, including anothe Gmail account and two Yahoo! mail accounts; the usernames of all three accounts are also redacted in the public record. The warrant attachment referenced Rosen's connection to Stephen Kim, who was under investigation by the FBI for allegedly telling a reporter that North Korea may test a nuclear bomb. On May 21, 2013, the government filed a motion to unseal entire docket of Rosen's case, including the application for the search warrant, the attachment to the warrant, Reyes' affidavit, and the granted warrant, with only names and dates of birth redacted for privacy reasons. On May 22, 2013, the court granted the government's motion in a memo and order that directed the case to be a matter of public record. The memo detailed clerical errors which stalled the placement of the redacted warrant and related materials into public record. The memo apologized for the administrative errors and instituted the inclusion of a new tab on the Court's website solely for the publication of search warrants. Executed warrants will be part of the public record unless a "separate sealing order is entered to redact all or portions" upon a showing by the government as required by United States v. Hubbard, 650 F.2d 293 (D.C. Cir. 1980) and Washington Post v. Robinson, 935 F.2d 282 (D.C. Cir. 1991). In a separate order that same day, the court ordered that the Clerk place on the public docket a redacted version of the government's motion to unseal entire docket and that the government produce unredacted versions of all unsealed material to the defense in United States v. Stephen Jin-Woo Kim. Yesterday the Digital Media Law Project, with help from the Cyberlaw Clinic, filed an amicus brief in the United States Court of Appeals for the Third Circuit in United States v.
On Sept. 10, 2012, Haitian Prime Minister Laurent Lamothe and "prominent businessman" Patrice Baker filed suit in federal court against Haiti-Observateur Group, an online and printed news publication, and Leo Joseph, a Haitian-American journalist who owns and edits Haiti-Observateur. The plaintiffs claimed that the defendants published defamatory statements in two articles, titled "La Haitel en vente pour 25 million $?" and "Global Voice et SOWCI ensemble pour ruiner la TELECO." The articles reported on the roles Lamothe and Baker played in the sale of the Haitian telecommunications company Haitel, claiming that the plaintiffs orchestrated or already profited from the sale. The complaint alleged that 10 specific statements published were false and defamatory, calling the statements "outrageous, scandalous and reminiscent of a tabloid publication." The plaintiffs argued that the statements were defamatory both (1) facially, saying the statements attributed conduct including illegal business practices, racketeering, corruption and conspiracy to the plaintiffs; and (2) per quod, implying degrading conduct when taken in context and thereby exposing the plaintiffs to "distrust, hatred, contempt and obloquy." The complaint alleged that the defendants' statements were "false and conjured to destroy reputations" and had injured the plaintiffs' good names, "stellar" reputations, and standing in their communities, noting the large Haitian population that resides in the Southern District of Florida, where the suit was filed. In filing suit, the plaintiffs sought damages, interests, costs, and attorney's fees. On Jan. 16, 2013, the clerk entered a default against defendant Joseph because he failed to respond to the complaint. Haiti-Observateur Group had already been dismissed as a defendant in the plaintiff's amended complaint. On Feb. 5, 2013, the plaintiffs filed a motion for entry of default judgment, attaching a proposed order for the court to use. The court formally issued the same order on Feb. 6. The order stated that the plaintiffs had succeeded on the merits of their defamation claim, that the defendant's statements were made with actual malice, and that the damage to the plaintiffs' reputation constituted irreparable harm. Further, the order permanently enjoined Joseph from publishing any future communications about Lamothe or Baker "in either their professional, personal or political lives." On March 4, 2013, Joseph filed a motion with the court to set aside its entry of default and default judgment. Joseph claimed that the court's order constituted an unconstitutional prior restraint and that the court was not allowed to permanently enjoin defendants in defamation cases. Joseph also argued that the order contained an error of law because there were no well-pleaded allegations of actual malice, and therefore the plaintiffs failed to state a claim. He argued that the complaint had not alleged clear and convincing evidence of actual malice, but merely presented a legal conclusion not entitled to the assumption of truth, especially in the case of default. Joseph further argued that the plaintiffs were not entitled to a presumption of injury, and that he had not been properly served. relationships and difficulty quantifying the actual damages. The plaintiffs also claimed that the defendant was properly served. On April 9, 2013, the judge issued an order on the motion to set aside the default judgment. The court found that the complaint's assertion that "[d]efendants' statements were made with actual malice" was a legal conclusion and thus did not fulfill the requirements for a well-pleaded allegation. Therefore, the court ordered the plaintiffs to file a second amended complaint setting forth the facts that support their allegation of actual malice. Regarding whether the order was an unconstitutional prior restraint, the court found that because the plaintiffs had not asked for an injunction in their complaint, injunctive relief should not have been entered. The order stated, "[T]he Court cautions Plaintiffs that prior restraints on speech are disfavored." The court noted that the plaintiffs sought to enjoin more than just defamatory speech, and "[j]udgments that enjoin the publication of non-defamatory statements are invalid." Because there is a well-settled rule prohibiting injunctions in defamation cases, the court noted, the plaintiffs were required to include specific facts in their second amended complaint that would warrant such "extraordinary relief." The court also found that there was no proof of the plaintiff's assertions that the defendant had been properly served. The plaintiffs filed a second amended complaint on April 19, 2013, which asserted that defendant Joseph knew that the allegedly defamatory statements were false, in part because of his business relationship with a shareholder of Haitel, and also because it was common knowledge that Haitel was never sold. Additionally, the second amended complaint included a new claim of tortious interference with advantageous relationships. The plaintiffs claimed that the alleged defamatory statements caused the plaintiffs' business relationships and political counterparts to question whether Baker was being investigated by the FBI and whether Lamothe acted consistently with Joseph's allegations, causing damage to the plaintiffs. The second amended complaint also asked the court to enjoin Joseph from publishing false and defamatory statements concerning the plaintiffs. On April 25, 2013, Joseph filed a motion to dismiss the second amended complaint for failure to state a claim. Joseph claimed that the second amended complaint did not satisfy the pleading requirements because it did not directly quote the specific statements alleged to be defamatory and the plaintiffs did not attach copies of the relevant articles. Joseph also asserted that the second amended complaint did not allege that Joseph published the statements with actual malice because it did not allege Joseph's subjective knowledge of falsity. Joseph also argued that the plaintiffs failed to state a claim for tortious interference, because (1) that claim was based on the same statements as the defamation claim and would fail with it and (2) the second amended complaint did not properly allege all of the elements of the claim. The court issued its order on the motion on May 30, 2013. It agreed with Joseph that the second amended complaint was defective because the court could not determine whether the statements were defamatory without the plaintiffs submitting the relevant articles and because the plaintiffs merely summarized the allegedly defamatory statements. The court granted the plaintiffs an opportunity to cure this in a third amended complaint. The court also advised the plaintiffs that some of the summarized statements were not clearly defamatory. Regarding actual malice, the order stated that the second amended complaint's allegation that Joseph had knowledge of the falsity of his statements, while "not a model of clarity," could arguably be sufficient to support the plaintiffs' claim of actual malice. The court thus ordered the plaintiffs to file a more definite statement of the allegation. The court further stated that "a determination on whether the single publication rule bars [the tortious interference claim] is premature at present." The order also stated that the plaintiffs could only amend their complaint "to cure the defects identified in this order," and that the order was the final opportunity for the plaintiffs to cure the defects. On June 14, 2013, the plaintiffs filed a third amended complaint. The third amended complaint asserted, among other things, that Joseph had acknowledged the falsity of his statements in a teleconference and that he acted with actual malice "by utilizing his publication to publish statements which benefit him and his business partners/creditors while having knowledge as to their falsity." The third amended complaint gave exhibit citations for each statement allegedly written by the defendant. It contained no claim for tortious interference. (4) the plaintiffs did not sufficiently plead actual malice, because rather than alleging facts to indicate Joseph's state of mind at the time of publication, they relied upon alleged facts occurring only after the statements were published. Congratulations to The Lens on its Section 501(c)(3) Determination! The Digital Media Law Project would like to congratulate The Lens, the New Orleans area's first nonprofit, nonpartisan public-interest newsroom, on obtaining a positive ruling on its Section 501(c)(3) status from the Internal Revenue Service! Read more about Congratulations to The Lens on its Section 501(c)(3) Determination! No More Art Cops in Los Angeles? Read more about No More Art Cops in Los Angeles? Datz was charged with obstructing governmental administration, N.Y. Penal Law § 195.05. The charge was later dismissed. On April 11, 2012, Datz filed a lawsuit in the United States District Court in the Eastern District of New York against Milton and Suffolk County, alleging that the police violated Datz's rights under the First, Fourth, and Fourteenth Amendments of the United States Constitution, Article I, Sections 8 and 12 of the New York State Constitution, as well as the Privacy Protection Act (42 U.S.C. § 2000aa). The complaint also contains claims of false arrest, assault, and battery. According to the complaint, Suffolk County Police seized the videotape from his camera as evidence and held it until one hour after his release that evening. The complaint also makes several allegations in support for its demand for injunctive relief against Suffolk County barring the county from obstructing journalists and members of the public who are recording police activity in public places. These allegations include several other incidents where Suffolk County police and firemen ordered Datz to stop filming police activity from public property, and some instances the police deliberately expanded crime scene perimeters to keep the press from filming crime scenes. Sergeant Michael Milton answered the complaint on May 2, 2012. The case is currently in discovery. As of February 2014, dispositive motions are due March 24, 2014. Carlos Miller, News Videographer Files Suit Against Suffolk County PD Over Video Arrest, Photography is Not a Crime, April 11, 2012. NYCLU Files Civil Rights Lawsuit On Behalf Of Cameraman Arrested By Suffolk Police, CBS New York, April 11, 2012. Steve Myers, News Photographer Arrested on Long Island for Videotaping Police, Poynter, August 1, 2011. TechnoBuffalo, LLC; Media Temple, Inc.; Google, Inc.; AT&T, Inc.
On September 1, 2011, Johns-Byrne Company filed a Rule 224 action in Illinois state court. Rule 224 allows a party to conduct limited discovery, before filing a lawsuit, in order to determine the identity of the party that allegedly caused the plaintiff's damages. The action was based on an August 17, 2011 post on the tech-news site TechnoBuffalo. The post contained photographs of and information about an upcoming Motorola smartphone. Johns-Byrne's petition for discovery stated that the company had been involved in printing promotional material for Motorola, and that the images recieved and posted by TechnoBuffalo were of this promotional material. Johns-Byrne alleged that the photos disclosed a trade secret, and stated that the party that took the photos and sent them to TechnoBuffalo "may have been" a Johns-Byrne employee. Johns-Byrne's petition sought discovery from TechnoBuffalo and its web-host Media Temple, as well as from Google (TechnoBuffalo's email service) and AT&T (because Johns-Byrne had reason to believe that the photos were taken with an iPhone and possibly sent over AT&T's network). Johns-Byrne hoped to discover the identity of the party that took and sent the pictures. Court documents stated that Media Temple, Google, and AT&T all "agreed to comply" with the discovery request. On September 26, though, TechnoBuffalo opposed Johns-Byrne's petition. TechnoBuffalo asserted reporter's privilege, both under California law (where TechnoBuffalo is based) and under Illinois law (where Johns-Byrne is based, and where the discovery action was filed). TechnoBuffalo argued that under either state's law, it was protected from attempts to reveal the identity of a confidential source. On October 17, Johns-Byrne responded to TechnoBuffalo's opposition. Johns-Byrne argued that Illinois, not California, law should apply, and that TechnoBuffalo's content did not qualify as "news." Instead, Johns-Byrne argued, TechnoBuffalo's coverage of technology "was nothing more than commercial hype intended to excite the blog's followers." Thus, TechnoBuffalo failed to "rise to the level of legitimate journalism." On November 7, TechnoBuffalo filed a reply brief. TechnoBuffalo relied on O'Grady v. Superior Court, a 2006 California state court case in which two tech news websites successfully invoked California's reporter's privilege, and Mortgage Specialists v. Implode-Explode Heavy Industries, a 2010 New Hampshire case which ruled that a website could claim the state's newsgathering privilege. TechnoBuffalo also argued that Too Much Media v. Hale, among other cases cited by Johns-Byrne, was inapposite. In Hale, a New Jersey court ruled that a message-board poster could not invoke the state's shield law. TechnoBuffalo pointed to the Hale court's distinction between a "news-oriented website" and someone who "randomly comments" on public forums. On January 13, 2012, the Cook County Judge granted Johns-Byrne's petition for discovery. The judge used Illinois law to rule that TechnoBuffalo's reliance on the reporter's privilege was "misplaced." The judge stated that TechnoBuffalo's site "did not encourage a well-informed citizenry," and that the "anonymous 'tipster' is hardly an example of a 'source' of investigative journalism" deserving of protection. Thus, Johns-Byrne could begin discovery. On July 13, 2012, the Cook County Judge granted TechnoBuffalo's Motion to Reconsider, thereby denying John Byrne's Rule 224 petition for discovery. According to the court, "TechnoBuffalo is a news medium, its employees are reporters ... and TechnoBuffalo is protected by the Illinois reporter's privilege." The Antioch Papers, an investigative journalism and media arts website, maintains and "open archive for primary source materials that document the institutional life of Antioch College and by extension Antioch University." Source materials have been gathered through publicly accessible archives and through submissions by institutional whistle blowers. On February 29, 2008, Antioch University sent a letter to The Antioch Papers demanding the removal of documents that the University alleged included attorney/client privileged communications and proprietary business and financial planning documents. The Antioch Papers responded in a letter dated March 12, 2008, asserting a First Amendment right to publish the materials at issue. No further actions on this dispute have been reported; the operations of Antioch College were suspended in July 2008, apparently rendering this demand moot. CMLP Guide to Reporting on Occupy Protests Goes Mobile! Read more about CMLP Guide to Reporting on Occupy Protests Goes Mobile! CMLP ANNOUNCEMENT: Media Law in the Digital Age -- This Saturday, October 22! This Saturday, October 22, the CMLP, together with Kennesaw State University's Center for Sustainable Journalism, will be producing and appearing at "Media Law in the Digital Age: The Rules Have Changed -- Again," an intensive one-day media law conference on the Kennesaw State campus north of Atlanta, Georgia. Read more about CMLP ANNOUNCEMENT: Media Law in the Digital Age -- This Saturday, October 22!